I don't know about you, but I still have a bit of everything to do in preparation for Christmas - a bit of shopping, a bit of cleaning, a bit (okay more than a bit) of baking. I don't think I'll ever be organized enough to have all my tasks done long before Christmas. You know what helps? Christmas music. Especially old Christmas music. 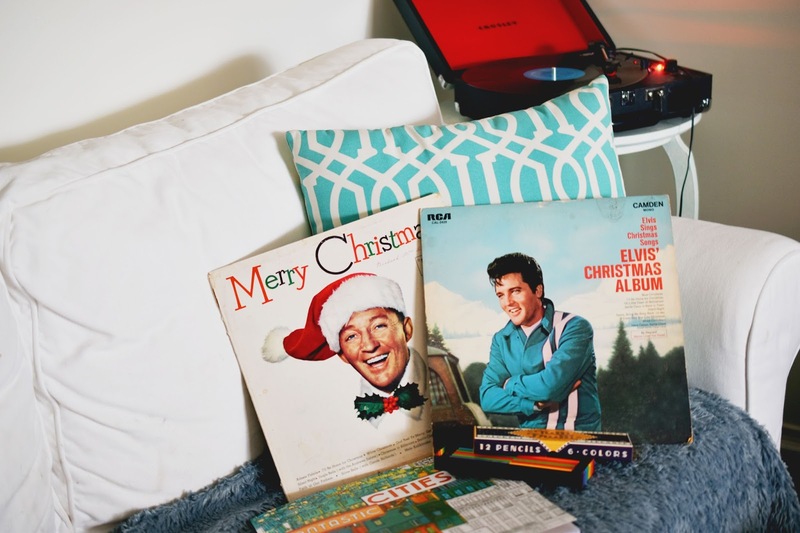 While I was putting together my Book Lover's Christmas Gift Guide, I pushed myself onward by listening to vintage albums - in particular Elvis' Christmas Album and Bing Crosby's Merry Christmas. The uneasy feelings that come from being way behind on your to-do list are reduced by listening to these classic Christmas songs. Do you have classic Christmas albums? I'm afraid to ask, but are you all ready for Christmas? Two classic albums. Thanks for hosting Vintage Bliss 64. Appreciate visiting and joining in. Season's Best Wishes. Thanks for visiting and joining in Joy! Happy Holidays! Joann, I am in exactly the same place you are about Christmas. I have a little bit of this and that to do. I listen to Christmas music and it is calming! I have that Merry Christmas by Bing Crosby! It is definitely a classic! Wishing you and your family a Very Very Merry Christmas!